Mediterranean countries are those that surround the Mediterranean Sea. 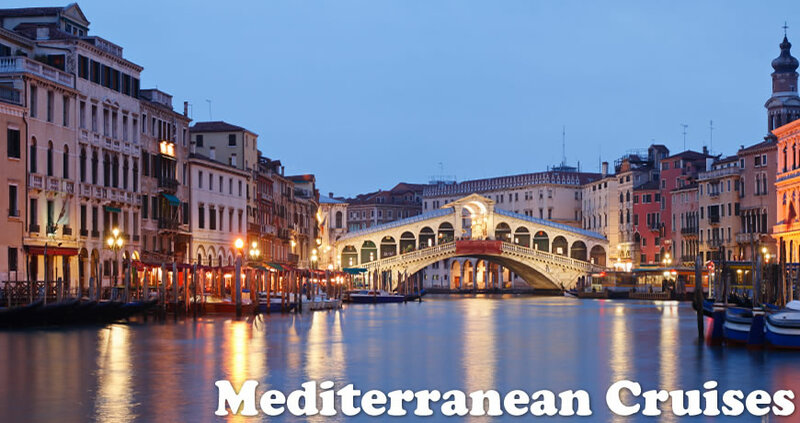 Although there are more than twenty, for simplicity sake cruise lines divide their itineraries into an eastern region and a western region with Italy being somewhat of a dividing line. 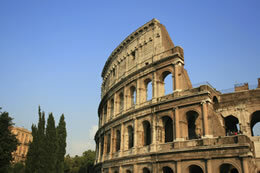 Italy is also the common link, and a focal point on almost every Mediterraneancruise. The islands and ports along the southern coast of Croatia, Spain, Portugal, France, and Italy are considered the Western Mediterranean. The Eastern Mediterranean encompasses the territories that range from the eastern coastal regions of Italy to the Greek Isles to Turkey and Egypt. A longer cruise may cover portions of both sides of the Mediterranean. For many, the Mediterranean is a dream vacation. People are commonly drawn to the Mediterranean by its sparkling azure waters, variety of cultures, and nearly perfect climate…and then there are the other reasons. You see, each traveler packs their own dreams and desires of what they want from their cruise. And with so many cultures to explore, sights to see, food to taste and landscapes to photograph, each person returns having had their own dream come true. What will yours be? Maybe you appreciate art and architecture so it’s natural to want to search out the collections of great masters, magnificent sculpture, and majestic cathedrals. A visit to Barcelona would give you the opportunity to tour Casa Mila, Casa Batllo, and the incredible Sagrada Familia, all works of the late Anton Gaudi. Try to leave time for the Picasso Museum, housed in a row of five Gothic palaces where Barcelona’s aristocrats lived in late medieval times. In Italy, the work of Michelangelo is everywhere. 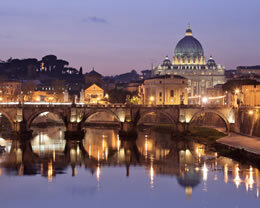 The Pieta at St. Peters, the Sistine Chapel at the Vatican Museum, and the David in Florence will leave you breathless. Roman architecture and engineering is arguably its greatest contribution to modern times. Classic monuments such as the Coliseum and Pantheon are still glorious today. In Istanbul, there’s much to admire at the Topkapi Palace, the crown jewel of the Ottoman Empire and the largest and oldest palace in the world. If you’re a connoisseur of food and wine and your palate is ready to explore new tastes where better than the Med, where gastronomy is taken so seriously! Dishes made from fragrant olive oil, ripe tomatoes, fresh vegetables and intricate spices make every meal delectable! Tapas with sangria in Spain, pasta with chianti in Italy, moussaka with ouzo in Greece and balik izgara with raki in Turkey. Searching out the non-touristy restaurants for authentic regional menus, trips to wineries that include tastings, and afternoon cooking classes are some of the experiences that await you on a Mediterranean cruise. History may be your compelling reason for wanting to travel to the Mediterranean. In ancient times Athens was known as the artistic and intellectual heart of Greece. It was here that the concepts such as philosophy, literature, drama, and science were born. So a visit to the area wouldn’t be complete without a stop at the Acropolis. If you’d like a glimpse of life in ancient times, visit the well-preserved remains of Pompeii during your stop in Naples. The city was founded in the sixth or early fifth century B.C and became a prosperous port and resort with many noted villas, temples, theaters, and baths. It was buried in ash by an eruption of Mount Vesuvius in 79 A.D. however; much has been excavated in past years. 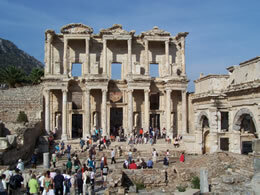 You might also find Ephesus to be very interesting, as the city was one of the greatest seaports of the ancient world. It’s also where you can see the Temple of Artemis, considered one of the seven wonders of the ancient world. Ephesus is also a sacred site for Christians due to its association with several biblical figures, including St. Paul, St. John the Evangelist and the Virgin Mary. Lastly, is it wrong to want to travel so far just to emerge yourself and the one you love in the romance of the Old World? Gondola rides through the canals of Venice, sharing secrets over a bottle of wine at a café on the cliffs of Positano, or strolling hand in hand through the winding, narrow cobblestone streets of Eze. Spending days lounging on hot, sultry beaches and nights devoted to lengthy, languorous meals. This is life at its best! 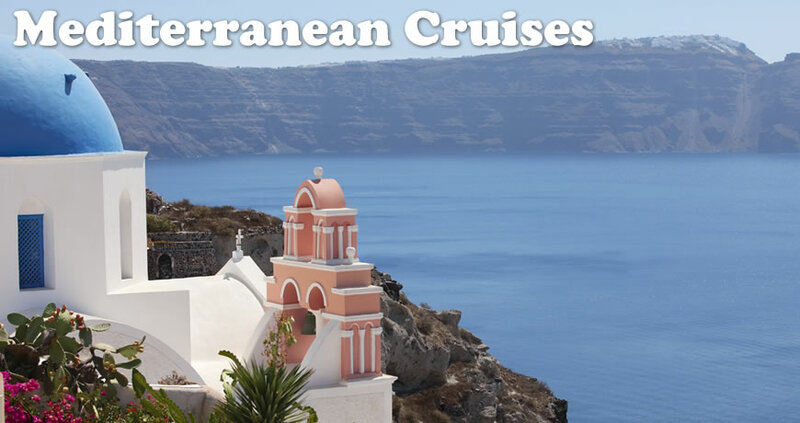 When you cruise to the Mediterranean you add a dimension that makes this a trip like no other! The ships are comparable to high-end hotels with amenities like spas, gyms and entertainment that enhance your experience. Best yet, you only unpack once instead of schlepping overstuffed bags from place to place! Cruising makes a trip to the Mediterranean stress free. You can visit multiple regions or cities and never have to worry about the complicated logistics involved in overseas travel. And since cruising is so inclusive, even the most budget conscious can keep their spending in check. So, isn’t it time you discovered the Mediterranean of your dreams? The tastes of the Mediterranean are ubiquitous throughout the world, and its history a keystone in textbooks. But why only read about the ruins of Rome, or yearn for the tastes of Italian and Greek cuisine? Instead, briefly envelope yourself in each one on a Mediterranean cruise. 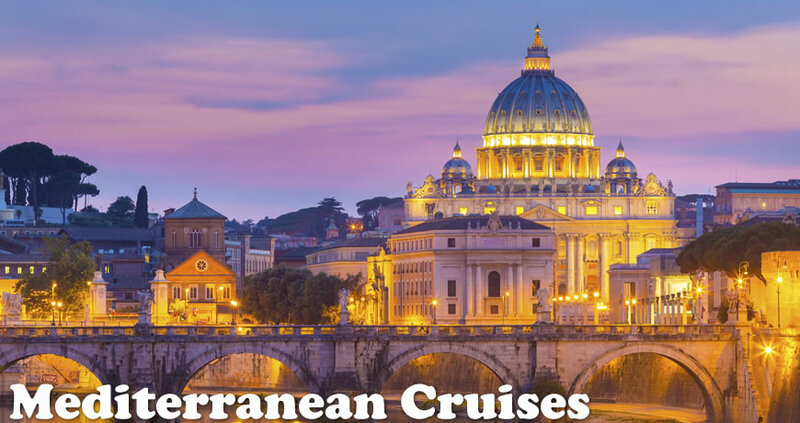 The most thorough and enjoyable way to experience the unique culture, history, and cuisine surrounding this notably azure body of water, a Mediterranean cruise essentially offers two itineraries. 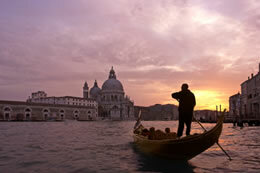 Western cruises cover all countries west of Italy, including Spain, Portugal, and France. Gibraltar, Barcelona, and the French Riviera are common stops along this adventure. Eastern cruises touch on the countries on the other side of Italy, including Greece, Croatia, Turkey, and possibly even Egypt. The pleasant warmth of the Mediterranean climate enhances each trip, regardless of each itinerary, and numerous architectural, historical, and gastronomic attractions await passengers at each port. From Barcelona, Spain to Rome to hints of the Ottoman Empire in Turkey, historical attractions, with the draw of their architectural and artistic influences, are essential on a Mediterranean cruise. While seeing the sites, taste the cuisine of each region. With some of the most recognizable dishes in the world, the Mediterranean is home to Spanish tapas, the many regional varieties of Italian cuisine, and Middle Eastern-influenced Turkish dishes – not to mention all of the possibilities in France, Greece, and Portugal. 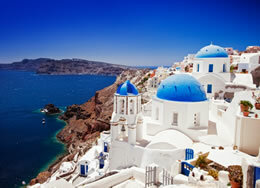 A Mediterranean cruise’s mélange of culture and relaxation is popular with travelers all over the world. Starting such a journey can be done from several ports in Europe, all of which are great for a pre- or post-cruise vacation. Depending upon the length and itinerary you choose, such trips start from as far away in the continent as Amsterdam, Copenhagen, Hamburg, or England, or on the sea’s border at Istanbul, Rome, Venice, or Lisbon. Nearly all major cruise lines stop in the Mediterranean. In addition to considering the departure port and itinerary, choose from several cruises on board Azamara Club Cruises, Celebrity Cruises, Crystal, Cunard, Norwegian Cruise Line, Oceania, Regent, Royal Caribbean, Seabourn, and Silversea cruise lines.